Daria Khokhlova and Alexander Smoliyaninov (both with Bolshoi Theatre, Moscow) in La Esmeralda, Diane and Actéon Pas de Deux (AKA the Diana and Acteon Pas de Deux) music by Riccardo Drigo, choreography by Agrippina Vaganova. Russian Ballet Festival Lahti 2013. Daria Khokhlova was born in Moscow, in 2009 she graduated from the Moscow State Choreographic Academy (class of Elena Bobrova). same year she joined the Ballet Company of the Bolshoi Theater. She rehearsed under Lyudmila Semenyaka. Now her teacher-repetiteur is Nina Semizorova. 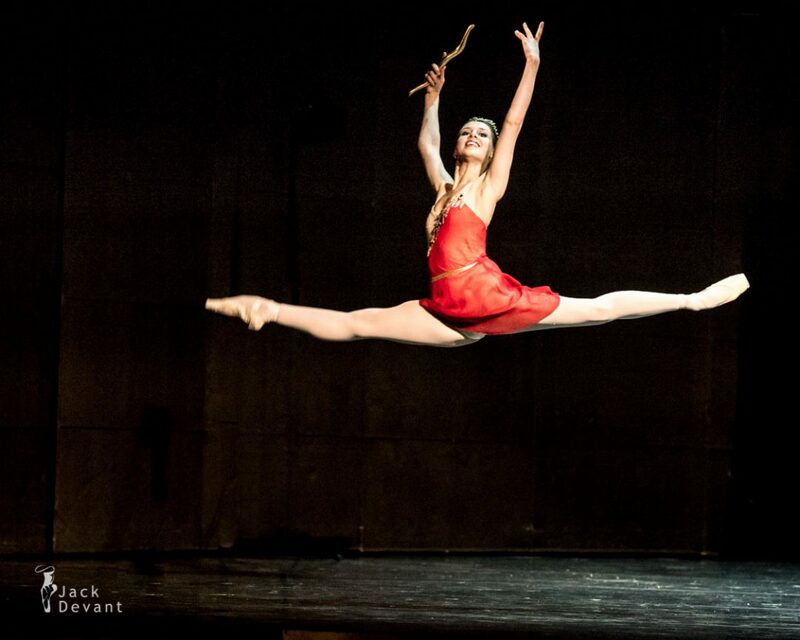 At present she is Soloist at Bolshoi and studies at the Department of performing arts at the Bolshoi Ballet Academy. Alexander Smoliyaninov is ballet dancer with Bolshoi Theatre. Agrippina Yakovlevna Vaganova (1879–1951) was a Russian ballet teacher who developed the Vaganova method – the technique which derived from the teaching methods of the old Imperial Ballet School, today the Vaganova Academy of Russian Ballet. It was Vaganova who perfected and cultivated this form of teaching the art of classical ballet into a workable syllabus. Her Fundamentals of the Classical Dance (1934) remains a standard textbook for the instruction of ballet technique. Her technique is one of the most popular techniques today. She is of Armenian descent. Vaganova’s whole life was connected with the Imperial Ballet (later the Kirov Ballet) of the Mariinsky Theatre in Saint Petersburg. She was accepted into the Imperial Ballet School in 1888, the great institution of classical dance founded by Anna of Russia and funded by the Tsars. She graduated from the Classe de Perfection of the former Prima Ballerina Eugeniia Sokolova. La Esmeralda is a ballet in 3 acts, 5 scenes, inspired by Notre Dame de Paris by Victor Hugo, originally choreographed by Jules Perrot; with music by Cesare Pugni and design by William Grieve (scenery), D. Sloman (machinery), Mme. Copere (costumes). Today the ballet is presented in its full-length form only in Russia, parts of Eastern Europe and New Jersey, United States. Outside of Russia, Eastern Europe and New Jersey only excerpts are given – the La Esmeralda Pas de Deux and the Pas de Six, but mostly the Diane and Actéon Pas de Deux is given, which in all actuality is not originally from the ballet (it is often miscredited as having been added by Petipa to his 1886 revival of La Esmeralda). Tsar Kandavl is a Grand ballet in 4 Acts-6 Scenes, with choreography by Marius Petipa, and music by Cesare Pugni. Libretto by Jules-Henri Vernoy de Saint-Georges, based on the history of King Candaules the Ruler of Lydia, as described by Herodotus in his Histories. From this work is derived the famous Diane and Actéon Pas de Deux (AKA the Diana and Acteon Pas de Deux).